Scroll Down For Video & Additional Pictures! 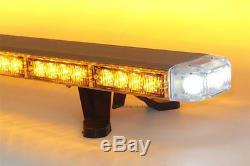 50 HIGH POWER LED SLIM SERIES AMBER WARNING LIGHT BAR WITH CLEAR LENSES. Full Function Display Control Box L & R Alley & Take-Down Lights Tri-Directional Traffic Director No Drill Roof Mounting Kit Power & Control Cables. Light bar can also be permanently attached with bolts (not included). Low Profile - Low Drag Design Improves Fuel Efficiency. Available to any street address within the contiguous U. All Warning Lights I Sell Are ISO 9001 Quality System Certified You should never even consider purchasing a warning light system that's not ISO 9001 Certified! The light bars I sell are manufactured to exacting specifications and they all include the h ighest quality LEDs, lenses, wiring and control box, and they are all ISO 9001 Quality System Certified! Not all LED light modules are created equal! If you pay for cheap junk, you'll receive cheap junk! This is a very high quality, professional grade, ISO 9001 Quality System Certified LED light bar warning system, built with the highest quality components, designed to provide emergency vehicles, tow trucks, snow plows, utility vehicles and other operators with years of trouble free service. 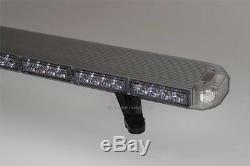 You will not find a higher quality LED light bar warning system offered anywhere at this incredibly low price. The following components are included. Aluminum light bar structure with 1 watt, 100,000 hour, latest generation LED modules. Full function, solid state control box controls and displays all light bar functions. Heavy duty, no-drill roof mount with brackets, roof hooks and hardware. 12 ft control cable, 9 ft fused main power wire & 8 ft ground wire (extension cables available). Simple do-it-yourself installation and operating instructions. Basic mechanical and electrical skills, and basic tools are required for a typical installation. Some slight modification (bending, cutting and/or drilling) of the mounting hardware may be required to fit some vehicle roof profiles and/or roof hook attachment points. The highest quality, 1 watt, 100,000 hour, latest generation LEDs. Heavy duty, dual board aluminum frame provides maximum durability. IP67 or higher dust and moisture resistant housing and lighting modules. 10 G-force shock, vibration resistance designed to resist daily punishment. 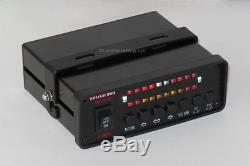 Control box allows user selection of 60 different flash combinations. Heavy duty feet and no-drill roof hooks for secure semi-permanent installation. Control box with individual front and rear on/off switch & flash pattern controls. 20 front flash patterns + 3 rear traffic director flash patterns = 80 total flash combinations. L ight bar measures approximately 50 (w) x 4. " (h) roof brackets typically add 1" to 1. Control box measures approximately 5" (w) x 2" (h) x 5 (d) requires approximately. Clearance behind control box for wires. 12 volts DC 10.8. 13.8 volts DC acceptable range operating voltage. 7.5 amp maximum 1. 6 amp typical operating current consumption. Very wide -40º F 130º F environmental operating temperature range. 10 G-force shock and vibration resistance designed for motor vehicle use. 12 ft control cable, 9 ft fused main power wire & 8 ft ground wire. Adjustable heavy duty no-drill roof mount with roof hooks and hardware. Maximum roof width (roof hook edge to edge) is 96 with included roof hooks. The light bar can be attached to the vehicle roof or rack using bolts and other hardware (not included) if a permanent installation is desired. Front Flashing & Take-Down Lights. Rear Traffic Director & Flashing Lights. Front Flashing & Alley Lights. Full Function Display Control Box. Light Bar Front & End. Light Bar Rear & End. Heavy duty no-drill roof mount with brackets, roof hooks and hardware are included. The no-drill roof mount included with your light bar may need to be adjusted (bent and/or cut) to fit the profile of your vehicle's roof. 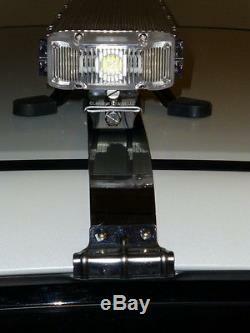 Roof hooks included with your light bar may appear slightly different than what's shown above. Includes all original equipment, accessories, instructions & packaging! CUSTOMER IS RESPONSIBLE FOR PAYING ALL INSTALLATION & REMOVAL CHARGES. Although the above times are usually accurate, they are not guaranteed. Every attempt will be made to answer any questions you may have as promptly as possible. Check with local, state and federal authorities, or your attorney, if you require information regarding the installation or use of warning lights upon a motor vehicle, vessel or other equipment. The item "50 AMBER LED LIGHT BAR FLASHING WARNING TOW TRUCK WRECKER POLICE FIRE EMERGENCY" is in sale since Monday, July 25, 2016. This item is in the category "Consumer Electronics\Vehicle Electronics & GPS\Other Vehicle Electronics". The seller is "leviathan_holdings" and is located in Saint Augustine, Florida. This item can be shipped to United States.